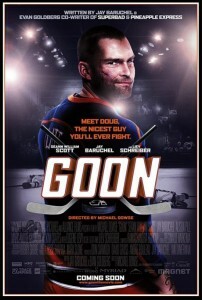 In the pantheon of sports films, most of the narratives have focused on triumphant, heroic athletes who possess tremendous skill but in director Michael Dowse’s new film Goon, the focus instead is centered on hockey’s enforcers, players who can’t play hockey at all but exist to defend their team when called upon with their fists. The screenplay was written by Evan Goldberg and Jay Baruchel (who also stars in the film) and is based in part on Adam Frattasio and Doug Smith’s book about Smith’s story of becoming an enforcer in hockey’s minor leagues. Smith’s character, named Doug Glatt in the film, is played by Seann William Scott who comes a long way from his role as Stifler in American Pie as he manages to make a very dimwitted brute fairly lovable and even redeeming. Glatt’s main opposition in the film is his lackluster teammates and the aging enforcer Ross Rhena played by Liev Schreiber who won’t go out with a whimper before retiring. The film is pleasantly surprising in the fact that it’s not just an in your face hockey beat down comedy, although it may seem so at times. Instead the heart of the film is in the more subtle character traits that Scott manages to bring to the character who at times is reminiscent of Being There‘s Chance the Gardener . Hockey fans will love it and Canadians might be legally obligated to see it but even if you don’t care about the sport the film is a pretty entertaining story which is bolstered by the fact that it’s true. Goon, starring Seann William Scott, Jay Baruchel, and Liev Schreiberand and directed by Michael Dowse will be in theaters March 30.